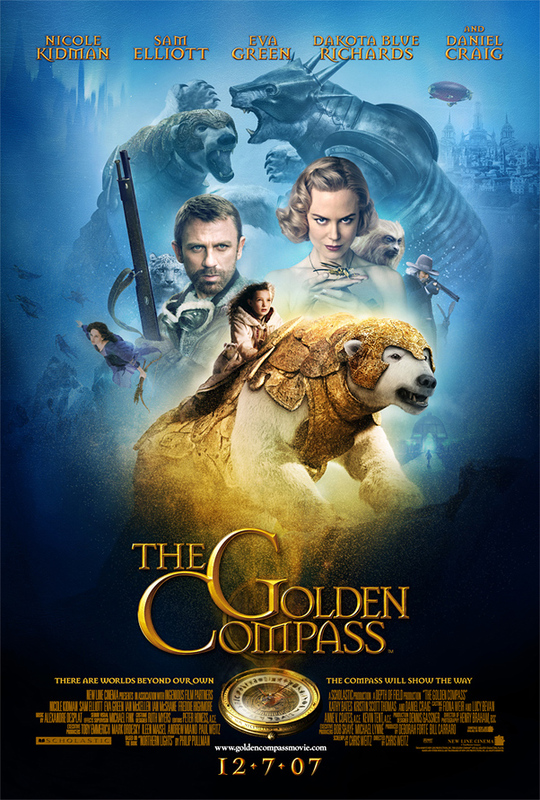 This week, New Line Cinema releases its latest fantasy film, The Golden Compass, starring Nicole Kidman and Daniel Craig. The film is the first in a trilogy called His Dark Materials, based on the novels of the same names by Phillip Pullman. I generally like fantasy - both books and films - and take interest in these sorts of things. But The Golden Compass appears to be one that should give Christians - especially Christian parents - concern. I have not read the books or seen the film, but I've been curious. Tonight I read Al Mohler's Briefing for Concerned Parents. Mohler has seen the film and read the entire trilogy. His briefing summarizes the story-line of His Dark Materials, gives some background on Pullman, and sounds a warning to parents. I'm not one to call for boycotts and I'm usually pretty tolerant of magic in children's movies. I've not been on the bandwagon against Harry Potter. I think it's more important to think through the worldview of a story than pick at specific elements. But that's just the problem with The Golden Compass. Pullman's atheistic worldview shapes his story in ways that are intrinsically evil and antagonistic to Christianity. Mohler's comments are very helpful. I'd recommend reading them, especially if your children (or you!) are attracted to the fantasy genre. Interesting. I have been meaning to get to the library to read the books since I have started hearing about the author. In my minimal research, he sounds very arrogant he really doesn't like Lewis at all and these books are supposed to be his counter to Narnia. He says Narnia is nothing but religious propaganda. He doesn't see himself as religious or spreading any kind of propaganda apparently so I don't think he is on the top level of intellectual. Thanks for the help...I have been curious since I read an article in Newsweek that was similar to what your thoughts are here. I have not read the books, but I have read about them. He sounds like he thought this out well; he made appealing fantasy books and made his point perfectly clear at the same time. I understand why people are interested! Talking animals, and famous people like Nicole Kidman, Sam Elliot, and even Ian McKellan (spell the last names right?) make the movie appealing! I am an avid fantasy fan, having read dozens of books in the genre. I picked up The Golden Compass because I had heard that it was quite good. After reading it cover to cover my only reaction was, "That was an utter waste of time." I have to say that I found Dr. Mohler's categorization of Pullman's work as "captivating, sophisticated, and truly interesting" to be far too generous. Add to that the issues that Dr. Mohler addressed and I would not recommend that anybody read this book. Ever. I do have to say that while the Magesterium is clearly modeled off of a Christian Church of some sort, I, for one, saw it more closely represent the Catholic Church and do not see that Pullman's caricature of religion will do any significant damage to Protestant Christianity at all.